The victim of a dog attack in Clearwater is is suing the dog’s owners for alleged negligence and liability. The male victim filed a complaint on Aug. 16 in the Pinellas Circuit Court, alleging that the dog owners failed to provide their guests with a safe environment. According to the complaint, the man alleges that he was invited by the dog owners to enter their home on April 17 when he allegedly was attacked by their dog and suffered bodily injury, pain, disfigurement, mental anguish and medical expenses. The man hold the dog owners responsible for allegedly failing to warn him of the potential risks of serious injury and for allegedly failing to properly supervise the dog. Every 75 seconds, someone in the U.S. is bitten by a dog. Last year, more than 830,000 dog attack victims required emergency medical care. Under Florida law, the dog’s owner can be held legally responsible for bite injuries even if the dog has never bitten before or exhibited dangerous behavior. If you or someone you know was hurt in a dog attack, there is a good chance that the dog’s owner will be held liable for the harm incurred. This means that they will likely be required to pay for medical bills, future treatments, lost income, plus monetary damages for your pain and emotional suffering as a result of the dog attack. Our Clearwater Dog Bite Lawyers at Whittel & Melton have seen the types of life-changing wounds suffered by dog bite victims, including permanent scarring and disfigurement and loss of limbs. We understand the trauma associated with these injuries, which is why we work attentively to help dog bite victims recover full and fair compensation for their suffering. Two people were injured, one severely, when they were bitten by a group of five pit bulls running loose near a St. Petersburg home. Officials said officers were called to the home on July 3 after the dogs were reported loose. A 52-year-old woman was bitten on the leg while trying to help her neighbor. The woman was hospitalized with severe injuries that required emergency surgery. The dogs reportedly charged the officers when they tried to exit their patrol car. The officers used fire extinguishers to force the dogs back. A Pinellas Animal Control officer who responded to the scene also had to fend off one of the dogs’ attacks. Eventually, at a point where all five dogs had jumped back into the home, officers were able to trap them inside by closing the windows. The dogs’ owner was not home at the time, but later helped the Animal Control officer load the dogs into a truck to remove them from the home. The owner, who just moved into the house a few days ago, according to neighbors, has not been charged, since police said there was no intent. The dogs will be kept under quarantine for further investigation. 20 percent of dog bite victims require medical attention. According to the American Veterinary Medical Association, more than 800,000 Americans receive medical treatment for dog bites every year. Unneutered male dogs are more likely to show aggression and are involved in 70 percent to 76 percent of reported dog bite incidents each year. 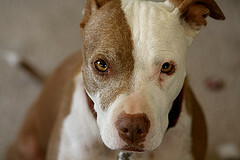 Pit bulls contributed to 64 percent of all fatal dog attacks last year. 57 percent of fatal dog attacks involve more than one dog. A fifth of the attacks involve packs of four or more dogs. An 8-year-old girl was hospitalized Sunday after suffering non-life-threatening injuries after she was attacked by a dog in Progress Village. Hillsborough County Fire Rescue responded to the scene of the attack at 2:20 p.m. The child was taken to Tampa General Hospital by ambulance with non-life threatening injuries, according to a spokeswoman for Hillsborough County Animal Services. Reports indicate the girl was bitten in the upper extremities while she and others were dog sitting inside a Progress Village home. An adult in the home was apparently embracing the child in a very enthusiastic manner when the dog attacked. At this time, no one is sure why the dog reacted the way it did. The dog that attacked the girl, an adult male American Staffordshire terrier, was taken by Animal Services where it will be monitored over the next several days. As of Sunday, the girl was recovering at the hospital. Dog bite injuries can be very painful and take time to recover from. These injuries can be made worse if an infection develops. It is quite common to suffer from severe swelling and bruising after a dog bite attack. Even worse, victims are likely to suffer scarring and possibly disfigurement. Because of the severe injuries that can occur from a dog bite or attack, it is important to contact an injury lawyer who can handle vicious animal attacks and help you seek the financial compensation you deserve to cover the full scope of your injuries.